An AMBER ALERT has been issued in Johnston, Rhode Island for a missing 2 year old Isaih Perez following a double homicide. The boy is believed to have been abducted by 22 year old Malcolm Crowell of Providence, RI.. The double homicide that occurred at 3 Oaktree Drive at about 5:20 a.m. The two people who were killed and Perez all lived at the address. According to police, the suspect is Malcolm W. Crowell, 22, and he fled the scene with 2 year old Isaih Perez. Police say Crowell had a link to the boy, but they wouldn’t elaborate. Two people are dead and police in Johnston, R.I., have issued an Amber Alert for a missing child, Deputy Chief Daniel Parrillo said Sunday. Parillo said witnesses saw Malcolm Crowell, 22, fleeing the scene of a double homicide early Sunday with 2-year-old Isaih Perez. Parillo said a description of the child was not yet available, but he described Crowell as a black male with brown eyes, standing 5’6″ and weighing about 145 pounds. Parillo said police won’t release much information about the homicide until Perez is found, but that the crime occurred inside the home. Parillo said officers were still trying determine Crowell’s relationship with Isaih and with the victims. Parrillo said Crowell should be considered armed and dangerous. 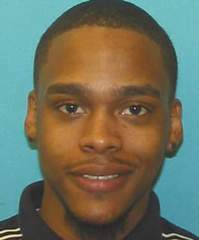 Suspect – Malcolm Crowell, 22, described as a black male with brown eyes, standing 5’6″ and weighing about 145 pounds. UPDATE I: The Providence Journal - Amber Alert issued for 2-year-old boy in connection with double homicide in Johnston. Police have blocked off the neighborhood near the crime scene. Crowell had some relation to the family but police said they would not comment on the connection until the boy is found, said Parrillo. A nationwide alert has gone out to other law enforcement agencies, he said. Neighbors along Shore Drive on Sunday reacted with fear and shock to a double murder and kidnapping just a street away. “It’s very scary. I’m just in shock,” said Jena Dimeo, who rents a home from her aunt. She held her 18-month-old daughter while police investigators combed the yard and gray two-story house at 3 Oaktree Drive. It’s a family-friendly neighborhood where neighbors know each other, Dimeo said. UPDATE II: White Pages.com shows the following two individuals live at that address: 3 Oak Tree Drive in Johnston, RI … Ronald A Fortunati & Abel Perez. A man arrested around 12:30 p.m. in Fall River, Mass. was misidentified by a state police spokesman as the suspect wanted in the boy’s disappearance, as WPRI reported at the time. Authorities have since retracted that suspect’s arrest, telling the TV station that the suspect taken into custody is not believed to be involved in the child’s abduction. UPDATE IV: Police are holding two men for questioning (Malcolm Crowell & Daniel Rodriguez ) in a double homicide this morning in Johnston and the kidnapping of a 2-year-old boy, who is still missing. One of the men was taken into custody at his workplace in Fall River, Mass., this afternoon and the other at a residence in Providence. Police said they expect the two will be charged in connection with the case before Monday morning. Malcolm W. Crowell, 22, was found at his workplace in Fall River, Mass., early this afternoon, Johnston Deputy Police Chief Daniel Parrillo said in a press conference at the police station late this afternoon. Daniel Rodriguez, who Parrillo said was born in 1985, though he was unsure of his date of birth, was taken into custody at a Providence home this afternoon. UPDATE V: Police arrest 22 year old Malcolm Crowell and 28 year old Daniel Rodriguez; however, Isaih Perez still missing. Police arrested Malcolm Crowell, 22, who had been described in the alert as “armed and dangerous,” at about 1:30 p.m. in nearby Fall River, Mass. The child was not with him, though, and they began looking for a second suspect. Daniel Rodriguez, 28, was arrested about 5:30 p.m. in Providence, police said. UPDATE V: Two year old Isaih Perez Found Safe!!! A 2-year-old boy missing in Rhode Island has been found wandering the streets of Providence, according to Johnston Police Deputy Chief Daniel Parrillo. Authorities had issued an Amber Alert for Isaih Perez on Sunday morning. The toddler was taken to a hospital to be checked out, but he appeared to be in good health, Parrillo said.